This section features some examples of complex filters built out of primitives. This example uses the Color Matrix to convert a photograph into an Alpha layer. The Alpha layer is then embossed by the Diffuse Lighting filter. Settings: Color Matrix: In: Source Graphics, Mode: Luminance to Alpha. 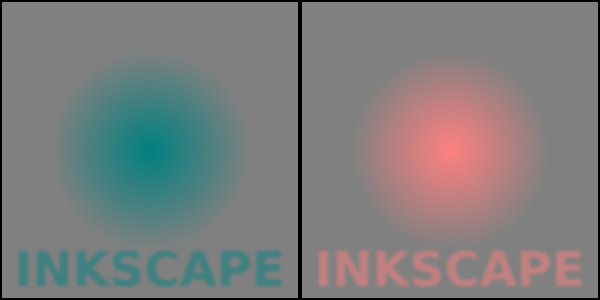 Diffuse Lighting: In: Color Matrix output, Diffuse Color: White, Surface Scale: 10, Constant: 2, Light Source: Distant Light, Azimuth: 45, Elevation: 15. This filter effect is broken in Inkscape v0.46. It displays properly in v0.47 as well as Opera 9 and Firefox 3. 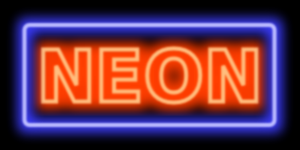 This example uses the Morphology primitive to create the glow around a neon tube. 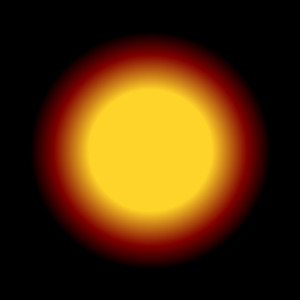 The glow color is derived from the neon color using the Color Matrix primitive. A couple Gaussian Blur primitives create the soft feel of the neon and a Merge primitive combines the neon and glow together. Settings: See below for overall structure and for Color Matrix primitive inputs. Morphology: Operator: Dilate, Radius: 6 (x and y); Gaussian Blur: Standard Deviation: first: 6, second: 1. 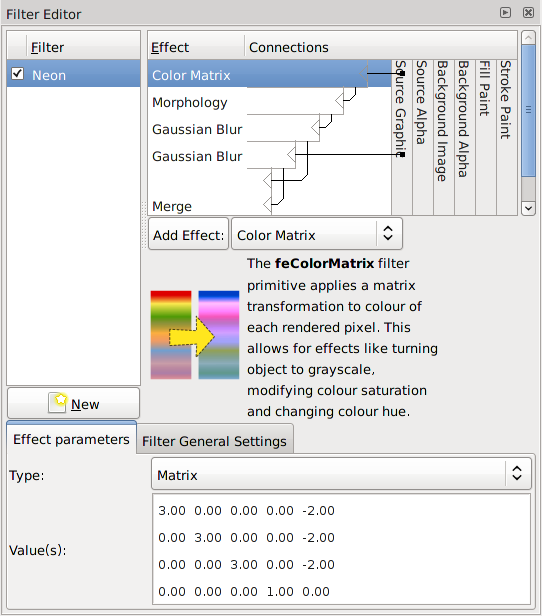 Filter Effects dialog for neon effect, showing Color Matrix parameters. This example uses the Displacement Map filter primitive to create a stereoscopic picture. 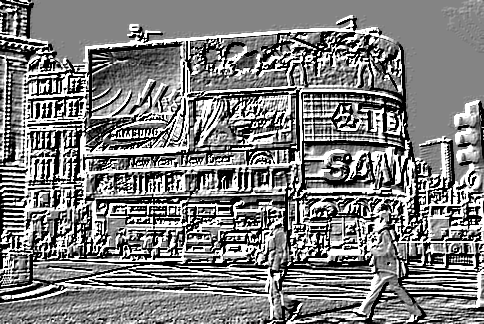 The Turbulence primitive is used to generate a picture that is distorted with the Displacement Map primitive. A stereoscopic image. Look at the left picture with the left eye and the right picture with the right eye. It may help to place a sheet of paper vertical and extending from your nose to the line between the two pictures. When your brain combines the two images, a shape should pop out. Settings: Turbulence: Input: Source Alpha, Type: Turbulence, Base Frequency: 0.1, Octaves 5, Seed 0. Displacement Map: Input 1: Turbulence output, Input 2: Source Graphic, Scale:: 10, X Channel: Red, Y Channel: Green. Composite: Input 1: Displacement Map, Input 2: Source Graphic, Operator: In. The Source Graphic. The red levels control the displacement in the x direction. This filter effect displays in Opera 10 but not Firefox or Batik. 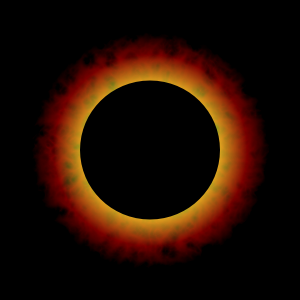 This example uses the Turbulence primitive to modify a radial Gradient,thus simulating a solar flare during an eclipse. A solar flare seen during an eclipse. Settings: Turbulence: Input: Source Alpha, Type: Turbulence, Base Frequency: 0.5, Octaves 3, Seed 0. Color Matrix: Input: Turbulence output, Matrix: All 0 except a00 and a33 are 1. 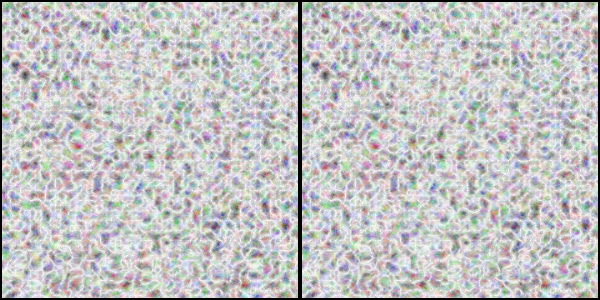 Composite: Input 1: Source Graphic, Input 2: Color Matrix, Operator: Arithmetic, K: 0, 1, −0.75, 0.